I find breads to be one of the harder things to make without wheat. If you look up recipes, you will often find ingredients that you've never heard of before and hunting them down in the grocery store proves pretty frustrating. I've found that it is easier to take a normal bread recipe and then experiment with non-wheat flours as substitutes. Normally for banana bread I use a mixture of oat flour and rice flour (if you use too much rice flour it comes out gritty) but I didn't have any oats or oat flour today so I decided to try something new. This time I decided to use a combination of Buckwheat flour, which doesn't actually contain wheat, and Soy flour. Both of these are pretty easy to find (Whole foods or your local health food store). Each on there own are pretty strong in flavor so I was a little nervous, but decided to give it a shot. I am really glad I did because they came out great and are more like banana bread then my oat version. Preheat oven to 350F. 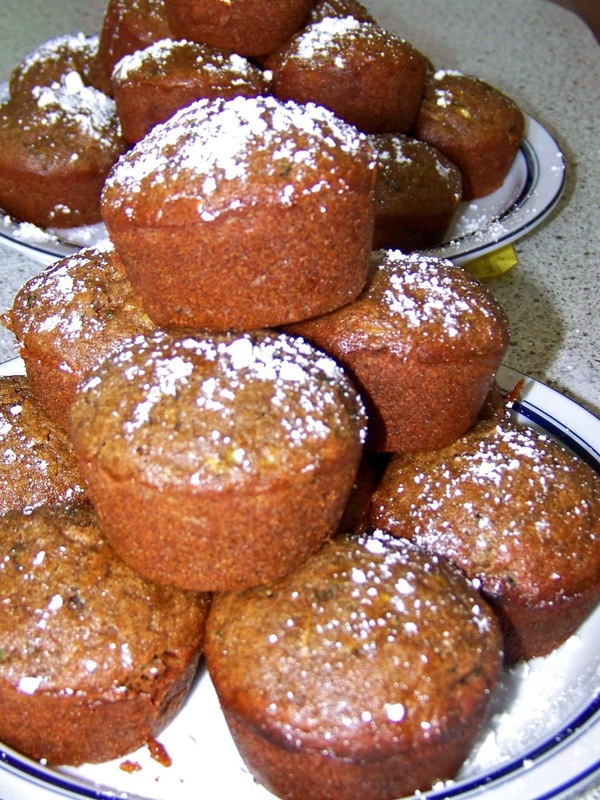 Spray medium muffin pan with nonstick cooking spray. Combine first 7 ingredients in a large bowl and then make a well in the center. Add eggs, banana, sugar, and oil to the center and combine them and mix in the dry ingredients. Pour or spoon batter into your muffin pan. Bake for ~20 min until a toothpick comes out clean. Cool for a few minutes before removing from pan, and then cool on a wire rack and sprinkle with powder sugar. Enjoy! Notes: Don't taste the batter. Before soy flour is cooked it has a very sour taste and leaves a horrible taste in your mouth. If you do taste it, don't worry the end result will taste great!